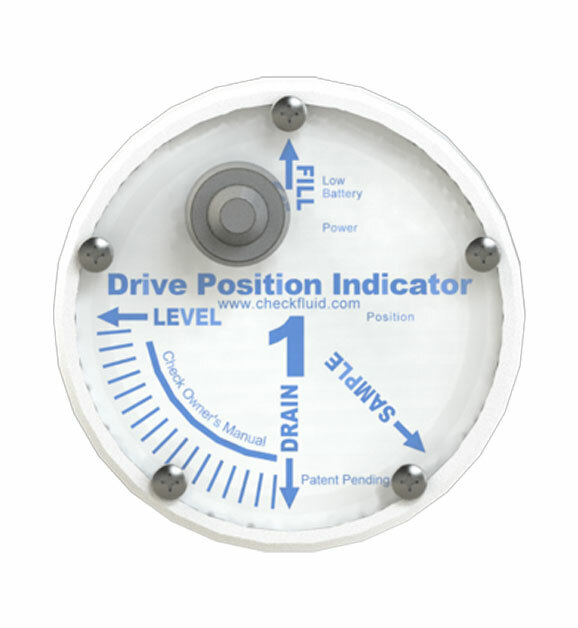 The DPI (drive position indicator) from Checkfluid is the first system developed with the sole purpose of orienting the drives axles for service. The Checkfluid DPI lets you quickly, safely and accurately position drive wheels for fast, simple fluid servicing - without leaving the cab or if spotting, without taking your eyes off the safety zone! Position the drive to fill, drain, level check or sample in seconds with accuracy and no need to climb out of the cab to check. In the past the equipment spotter was responsible for job site safety along with the orientation of the drive axles. The DPI allows the spotter to focus on potential safety hazards as the DPI is taking care of the positioning the drives. The DPI sensor from Checkfluid is the first automatic drive position indicator that lets service techs and spotters see exactly when planetary drive wheels are properly positioned for fluid service. It saves the service technician time by providing real time feedback on the drives current position, allowing for more services calls to be completed each shift. Just attach the DPI sensor to the wheel magnetically and roll your equipment forward or back until the DPI indicator unit signals that the track drive or wheels have rotated into the required position.